Obey Giant: The Art and Dissent of Shepard Fairey is an American documentary film that premiered on Hulu on November 11, 2017. 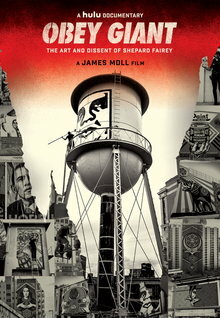 Directed and produced by James Moll, it explores the life and career of street artist and graphic designer Shepard Fairey. The film covers "Fairey's life from his beginning doodles to his iconic "Hope" poster for the Obama campaign and Obey campaigns." The documentary follows "the life and work of artist Shepard Fairey, going deep into the world of street art and its role in politics and pop culture. Obey Giant follows Fairey's rise from his roots in punk rock and skateboarding, to his role as one of the most well-known and influential street artists in the world - through his iconic Obama "HOPE" poster and the controversy that surrounds it." ^ Salud, April (November 9, 2017). "Shepard Fairey on 'Obey Giant' Doc, Progress and His Iconic Obama "Hope" Poster". The Hollywood Reporter. Retrieved November 11, 2017. ^ "Rotten Tomatoes - Obey Giant". RottenTomatoes.com. Retrieved November 11, 2017. This page was last edited on 24 September 2018, at 06:14 (UTC).